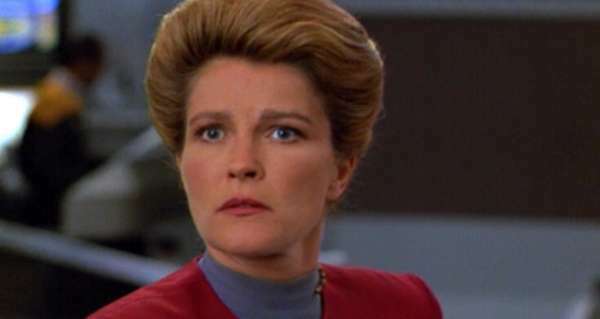 Here are some surprising facts about Captain Kathryn Janeway's hair and uniform you might not know. She was the captain of the Starfleet starship USS Voyager and was the lead character on the television series Star Trek: Voyager. Although there had been a few female captains shown in the series she was the first one to star in her own series. It was a ground-breaking decision at the time and is still a landmark television event. But oddly, being a woman meant there were some bizarre, strange and unusual decisions made about her hair and uniform. We've already talked about how other women of Star Trek have faced uphill battles about their costumes. Troi almost had four breasts. Seven of Nine almost passed out. T'Pol had to take out her belly button ring. But we decided to tackle how Janeway's hair, height, and breasts led to hilarious decisions. Here now are ten things you probably didn't know about Kathryn Janeway's costume. Sometimes the first episode of the show is very different from when the series airs. Sometimes the cast ends up very different. That was true of Star Trek: The Original Series when the Enterprise was piloted by Captain Pike. 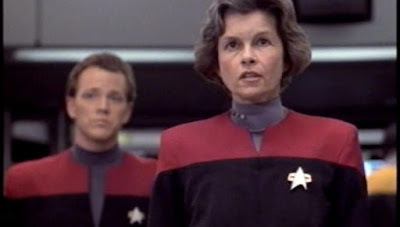 When the pilot for Voyager was shot they hired Geneviève Bujold to play Captain Janeway. The 52-year-old French-Canadian actress is best known for her Oscar-nominated and Golden Globe-winning performance of Anne Boleyn in the 1969 film Anne of the Thousand Days. In 1994 she was cast as Elizabeth Janeway. Geneviève Bujold began filming on 8 September 1994, but according to Entertainment Weekly, she quit three days later. Reports said she hadn’t done a lot of television before and wasn’t used to the grueling schedule. According to studio sources, she wasn’t ready for 18-hour days of a weekly series like Star Trek. "The joke on the set was there are no (shooting schedules)," says one source. "You just never go home." "When you’re coming from a film schedule," said Leonard Nimoy, who played Spock in the original series, "18-hour days are not comfortable. It’s the kind of thing people desperately in search of a career will do." Sources on the Voyager set claim Bujold was acting as "like a diva". She complained about restyling her hair and was uncomfortable with the makeup (Bujold’s spokeswoman denies this). "People were giving her s — – about it," says an insider. "Add that to all the hours and she just said 'God, let me out of this.'" So she did. On September 19, Kate Mulgrew began filming her scenes for Voyager. Everyone was excited and enjoyed the new atmosphere. After several days of shooting, they went to edit the episode and realized the horrible truth. They couldn't use any of the footage. Mulgrew wore her natural hair down and swept back. To their surprise, the producers noticed that the stage lighting made her fine hair almost see-through. That meant all of the scenes she filmed had to be shot again. The hair and make-up department scrambled to come up with a solution and put her hair up in a bun. 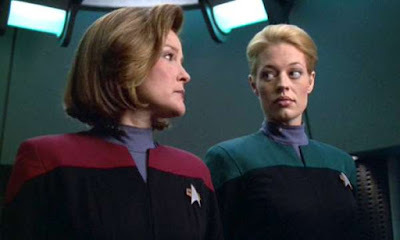 "When I joined [Voyager] at the eleventh hour, we had nothing but hair problems," Mulgrew told TV Guide in 1995. "Short? Long? With a hairpiece? Without a hairpiece? All the concerns were about my hair—the hair being the trademark of the woman, right?" Unfortunately, the damage was done. "We got a call from Kerry [McCluggage] after, like, the first day of dailies saying he hated Kate's hair," remembered executive producer Rick Berman. Jeri Taylor added, "When she moved her head, you could sort of see through the hair. There wasn't enough hair there (to create a solid mass). So we thought well, maybe this is not the hairdo and began doing other styles on her." After days of filming the studio realized their very expensive pilot was now going to be more expensive. The cost of the two-part episode "Caretaker" had already reached $23 million and the reshoots called for major expenses. That's more than some of the theatrical movies. First, there was the cost of shutting down production while they worked everything out. It took about a week. "As soon as we had hair situations worked out and uniform situations worked out, within a week we were shooting again," Rick Berman later said. Then, because she filmed some scenes on a soundstage at the Los Angeles Convention Center, they had to rebook the stage and would cost a fortune. Add to that the sets for the Ocampa "enclave" had already been taken down and needed to be rebuilt. "We ended up having to reshoot half of her stuff," Rick Berman later said. Michael Piller joked, "I can honestly say this is probably the only Star Trek pilot in which the hairdressing cost more than the special effects." Ever since Star Trek: The Next Generation the women on the shows often wore special bras to enhance their chest. Marina Sirtis, who played Deanna Troi, was the most open about it and praised them. She called them the "Industrial Strength Starfleet Brassiere". "Now, as you know, with a corset everything gets pushed up or down," Sirtis said at a convention. "What was pushed down was kind of enclosed in the skirt and what was pushed up was enclosed in what I named ‘the Industrial Strength Starfleet Brassiere', which was a wonder of modern engineering. I mean, I used to take it off at night and go ‘oh blimey, where did they go?'. In fact, we had guest stars - and I'm no Twiggy - who would come and see me in the morning as Marina and then they would see me two hours later as Troi, and they'd go to costume and go ‘I want that bra!'" Many actresses loved the bra. Penny Johnson Jerald, who played Kasidy Yates, in Star Trek: Deep Space Nine said they were the best part of the show for her. "I have to tell you," Jerald told Fandom. "One thing I loved about Star Trek? It's no secret. I loved the uniforms. And the best part of the uniforms, ladies? It was the bra. I'm telling you, these bras were monster bras. You could have the worst-looking upper chest but, my darlings, when you put that uniform on, those babies stood up like a silver platter, and they were beautiful." Kate Mulgrew, who reportedly wears a size 38B bra was expected to continue the tradition. Things didn't go according to plan. Reportedly she stormed into one of the producer's offices, threw the padded bra on the desk and said "No! I'm not wearing this!" When Robert Picardo, who played the holographic Doctor on Voyager was asked by about the story he couldn't confirm it but said "It sounds like something Kate would say. I certainly can't corroborate the story. Kate is just wonderfully outspoken." She's only one of only two female regulars from the "modern" Star Trek era to go without the "enhancement". Nana Visitor who played Kira Nerys on Star Trek: Deep Space Nine is the other. 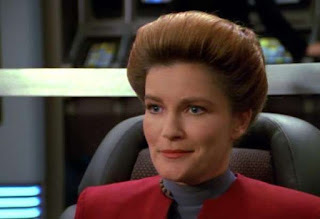 Kate Mulgrew had a wide variety of hairstyles on the show. Some were long and some were short but all were classy. But it turns out she had a little help. 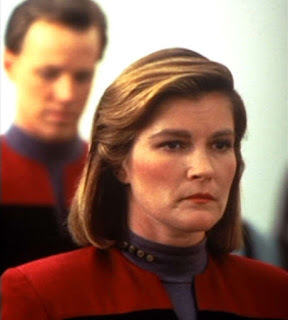 While trying to figure out what kind of hair Janeway should have they used a variety of wigs and hair extensions. "Towards the end that was half a wig and half mine, did you know that?" Mulgrew told fans at UK convention, "My own hair is much longer, much nicer, much prettier of course. 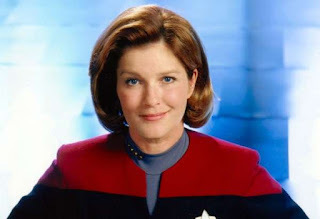 Why should Janeway wear that hair? No, let's order her a wig." Wigs aren't uncommon on Star Trek of course. Grace Lee Whitney, who played Yeoman Janice Rand in the Original Series wore a spectacular beehive hairdo. She quipped to Starlog Magazine that "they nailed" to her head every morning. Leonard Nimoy wore a wig to fashion his hair for Spock. Chekov wore a Beetles wig and Jolene Blalock wore a wig to play T'Pol. William Shatner was rumored to wear a wig to cover his bald spot. "I never understood it," Mulgrew added. "It drove me nuts. Every five minutes with the powder puff, the comb, and the brush all this before every scene they never stop touching me so in the end I just wanted to rip them off. I envy Patrick Stewart!!" Despite all the work to get her hair right in the pilot they continued to mess with her hair throughout the seven seasons. 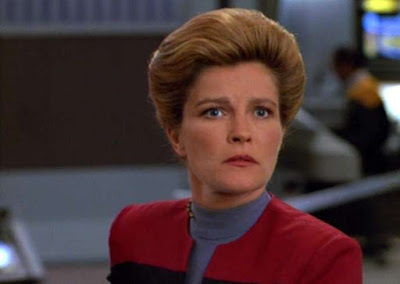 In fact, of all captains on Star Trek Captain Janeway had more hairstyles than any of them. According to an extensive study by Trek.fm Kate Mulgrew wore seven different hairstyles. From her natural hair to the "bun of steel". Contrast that with other captains. William Shatner had at least two if you count his hair on the original series and the more stylized one in the movies as the same. Patrick Stewart's Picard only had one and that's his original hair. Avery Brooks' Benjamin Sisko had two: his regular hair and bald. Scott Bakula's Jonathan Archer had two if you count his combover as separate. Jason Isaacs plays Captain Gabriel Lorca and, while it's only in the second season, appears to only have one hairstyle. Kate Mulgrew looks short on the show but she's average height. Women raised in the United States have an average height is currently 5 feet 4 inches (162.56cm). Mulgrew is a respectable 5' 5". Most of the male cast are between five foot ten inches (ex. Garret Wang) to six feet (ex. Robert Beltran). So Janeway wore four-inch heels so the cast didn't tower over her. That doesn't mean they had to be uncomfortable. At a convention, a fan asked her what was the hardest part of working on Voyager. "Most difficult?" she said thoughtfully. "Probably the first two, ‘Caretaker.' Indoctrination, tough. That bloody thing with my hair. Endlessly stupid hijinks with my hair! Not only my hair. My hair, my breasts, my feet, my waist. There was a woman in the captain's chair and they didn't know what to do. So it was all physicalized. How many times did they change my hairdo in the first six months? Ten? Who has a hairdo like that [mimics high hair bun] in outer space? I used to touch the nub for good luck. "I finally said to them at the end of the first season. Take this [mocks removing corset] thing they had in here. Take that. Take bobby pins. Take the boots off. Give me some shoes I can walk in and let me be Janeway. I can't be Captain Picard. "Of course, I know it was a numbers game and their demographic was men from 20 to 35. I get all of that. But men are not stupid. The last thing they want is a false captain, an impersonator. They want the real deal. So once they let me be me, the men came on board as they are wont to do." Kate Mulgrew's role as the first female Star Trek captain and a prominent scientist has inspired countless girls and women. 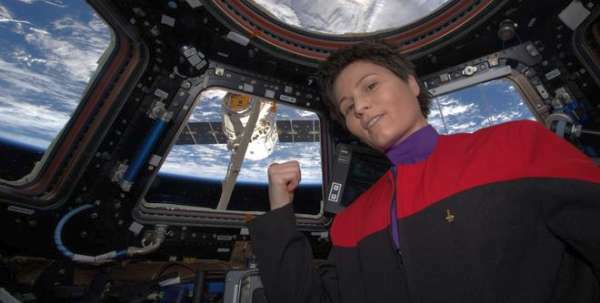 One of those is a European astronaut and Star Trek fan Samantha Cristoforetti. 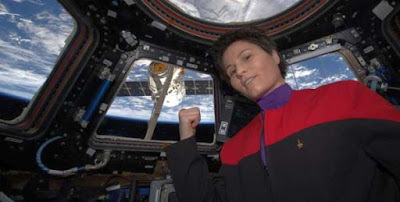 She's an Italian European Space Agency astronaut, Italian Air Force pilot and engineer. Cristoforetti currently holds the record for the longest uninterrupted spaceflight of a European astronaut. She held the record for the longest single space flight by a woman until Peggy Whitson broke the record. Cristoforetti was onboard the International Space Station when the Dragon capsule brought supplies including an espresso machine. She posted a picture of herself wearing a costume styled after Captain Janeway with her hair in a bun. Cristoforetti motions to the craft and wrote "'There's coffee in that nebula'... ehm, I mean... in that #Dragon" which is a reference to Janeway's love of coffee. Her love of Star Trek is well-known after posting a Vulcan solute shortly after the passing of Leonard Nimoy. She added "'Of all the souls I have encountered...his was the most human,'" quoting a line from the movie "Star Trek II: The Wrath of Khan." While Mulgrew is average height, she is below average in size. In the episode of Star Trek: Voyager called "Bride of Chaotica!" the show says that she wears a size four. Plunkett Research estimates that 68 percent of American women wear a size 14 or above. Some costume designers struggle with actors gaining weight, but for Voyager it was the opposite. 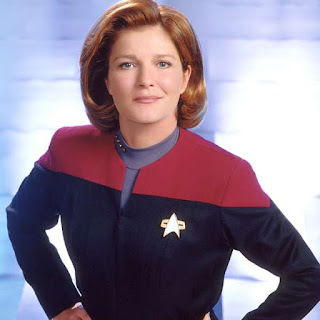 "We have to beg Kate Mulgrew not to lose weight," Costume designer Robert Blackman told Star Trek Monthly, "because she is very energetic and burns up the calories like there's no tomorrow. So to keep her at a US size 3 or 4 is very difficult sometimes." After Voyager went off the air Janeway was seen again. In Star Trek: Nemesis she orders Captain Picard to Romulus to meet the new praetor Shinzon. 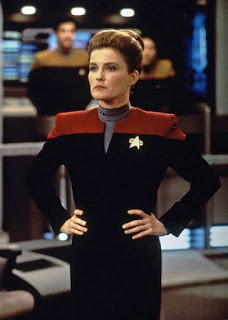 Janeway is wearing the uniform (and three pips) of a Vice Admiral. That's strange. We know Kathryn Janeway returned to Earth in 2378. Star Trek: Nemesis takes place in 2379. That means she was promoted from Captain to Vice Admiral in a little more than a year. If we follow the U.S. Naval rank designation (which doesn't track exactly to the Federation) she would have been promoted from Captain to one-star Rear Admiral (lower half), two-star Rear Admiral, then to Vice Admiral. Vice Admiral is a three-star flag officer in the U.S. Navy and closely corresponds to the rank of Lieutenant General in the other Armed Services. Usually, the rank of Vice Admiral is temporary and usually used in times of war. Either way, it usually takes a Naval officer ten or more years to become a Rear Admiral much less a Vice Admiral. Janeway was instrumental in defeating a Borg plague that swept Earth after Voyager's return. So either she got back and went through the ranks of Admiral to Vice Admiral in a year or was given the rank thanks to her services to the Federation in the Delta Quadrant. It's good to know she doesn't have to worry about those shoes in her new desk job. Ever since the early days of Star Trek the role of the person on the ship is shown by the color they wore. This was true even in Star Trek: Voyager. But the show played kind of loose with the idea. The uniforms Standard Duty Uniform style was introduced in 2369. That's almost two years before Voyager was stranded in the Delta Quadrant. 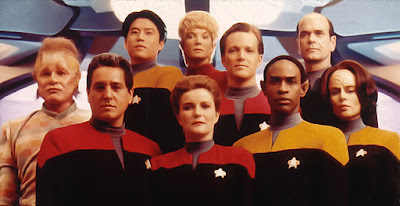 Since they were separated from Starfleet they stuck with the uniform colors. There are three division colors used on the uniforms: Red/Maroon shows they're part of the COMMAND division. Yellow/Gold shows they're in the OPERATIONS division. Blue/Teal shows they're part of the SCIENCES division. Janeway played the role of the science officer thanks to her background in science and was the science officer of the USS Billings before serving as captain of the USS Voyager. But if she spent so much time on the science of the ship why did she wear red? Most of the crew played dual roles on the ship. It was originally a military ship and had a small crew. While she was a science officer, she mainly answered as the ship's captain. So she wore red. From padded bras to silly wigs those are some things you might not have known about Captain Janeway's costume. What do you think of Captain Janeway's costume? Let us know in the comments below!